Over the last couple of weeks I’ve been showing you a few methods of making your own organic liquid fertilizers and microbial inoculants. Today I was hoping to continue that journey with the big three nutrients listed up above. A difficulty, though, is that we need a lot of them, not just a little. So while spraying some ocean water or liquified seaweed can get us a lot of the micronutrients we need, it’s harder when we need several pounds of the above three minerals per 1000 square feet. That’s why when I need to really boost one of these minerals in the soil, I’ve always gravitated to specific dry fertilizers like lime. They’re inexpensive and easy to use. The vast majority of soils are deficient in calcium. Usually the best way to get it back in there is a dry fertilizer like calcium carbonate (aka calcitic lime or high-calcium lime). And fortunately we have plenty of lime deposits all around the world, so it’s a fairly sustainable resource. In fact, this is the only mineral I recommend almost everyone should add, even if they don’t have a soil testing showing they need it. I would rather you get a soil test so you know for sure, but I know most people don’t do that. And I don’t want you to add a lot – just 10 pounds per 1000 square feet of calcium carbonate, as we don’t want to overdo it. Only a soil test will tell you if you need more than that. But those 10 pounds will be beneficial for over 90% of soils, and will rarely cause any issues. There already tends to be enough soil calcium in much of Colorado, Montana, northern Iowa/southern Minnesota, and parts of Texas, but most soils need more. Ten pounds of calcium carbonate is going to supply about 4 pounds of calcium. By the way, it’s also a very important grass fertilizer, because lawns really need calcium for many reasons, but especially to combat compaction. Is there a way to get calcium without buying lime? Well, maybe. Let’s start with eggshells. Many people have them, so that’s a good beginning. They’re mostly calcium carbonate, which is perfect. The only problem is that they’re rather small. There’s about 0.8 grams of calcium in an egg shell, so to get that 4 pounds of calcium, you would need about 2300 egg shells. If you’re gardening only 100 square feet, then you’d only need 230 egg shells, which is perhaps… well, still a lot. So yes, I sometimes use egg shells in my gardening, but mostly for houseplants or a handful of prized garden plants. It’s the same kind of math with other food products. There are 1.2 grams of calcium in a quart of milk, so you would need about 1500 quarts of milk to get that 4 pounds of calcium. That’s a lot of mooing. I do have a solution that’s much more plausible, if you have access to it, and that is wood ashes from a fire. Ash often contains 10-20% calcium, a decent amount – along with many trace minerals. The main issue is that it also contains perhaps 4-8% potassium. Now, potassium isn’t a bad thing unless we have too much of it, but most of us already have enough, so we usually don’t want to be adding more. 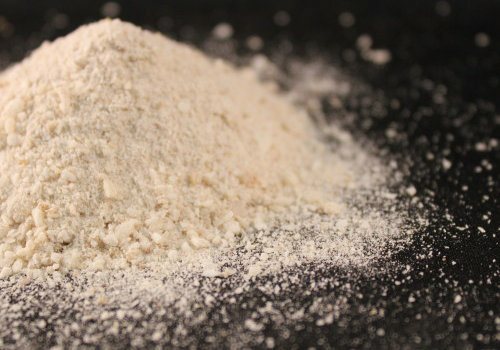 While it’s probably okay to add 10 pounds of wood ash to your soil per 1000 square feet, which will give you 1-2 pounds of calcium, I wouldn’t go adding much more than that unless you have a soil test telling you that you need both calcium and potassium. And be sure to add it in the dormant season, because it’s hard on biology if applied while microbes and plants are working away. Think of it kind of like a chemical fertilizer in that regard – it’s much better if it has time to mellow out in the soil for at least couple of months before planting. Ideally, you’d save your ash from the winter until the next fall and apply it then, to give it the winter to acclimate. Potassium is a quick one because most of us already have enough of it. If you’re using even a small amount of compost or manure, you probably have all the potassium you need. Those materials have less than 2% potassium, but that’s all we need. We need about 15 times as much calcium as both potassium and phosphorus, so calcium is the big one. Gardeners who use a lot of compost/manure often end up with too much potassium, which leads to all kinds of issues, especially calcium deficiency and soil compaction. But if you have a soil test showing that you do need potassium, compost is a great source. Banana peels contain about 8%, so they’re a good source if you happen to be blessed with an abundance of banana peels. Wood ash, as we’ve seen above, is a good source if you also need the calcium. The 2 main potassium dry fertilizers I like are K Mag and Greensand. K Mag is a high quality fertilizer if you need potassium, magnesium and sulfur, since it contains all three. Greensand is better if you just need potassium. Phosphorus is probably the second most important mineral in the soil after calcium. We need the same amount of phosphorus as potassium, but it’s far more common for our soil to be deficient in phosphorus. Compost contains about 1% phosphate, but since it contains on average about 4 times as much potassium, we max out on potassium before we get our phosphorus up where we need it. Having more potassium than phosphorus in the soil is the cause of a lot of issues. So we have to look elsewhere. If you have access to a pile of bones (I won’t ask why), you’re good to go. You just need to find a way to grind them up. Or put them into a hot compost pile and make some phosphorus-rich compost – they’ll disappear fairly quickly. I forget where I read this, but some fruit trees were once planted in a very old graveyard, perhaps by accident because the existence of the graveyard was no longer apparent, and when they went in and excavated everything many years later, the roots of the trees had grown all along the skeletal systems of the people buried there, assumedly mining the phosphorus and calcium. So yes, bones are good fertilizer. You can also buy bone meal, a dry fertilizer that’s been used by organic gardeners for a long time. The only issue is that it can carry the prions that cause mad cow disease, as well as relatively high levels of heavy metals. These things may or may not be all that big of a deal, but it’s generally not allowed in the organic standards for that reason, so I’ve tended to stay away from it. But it is about 12% phosphate. Quite good. And it has a lot of calcium, too, although calcium carbonate is considered a more ‘available’ form of calcium for the soil. Instead I use soft rock phosphate, a highly available form of phosphorus that also contains calcium and many trace minerals. It’s labelled as only about 3% phosphate, but that’s just because of the weird way those percentages are calculated. It actually contains a lot more phosphate than that, in line with bone meal. There are lots of things we can do to get small amounts of all of the the nutrients our plants and soil need – using seaweed, ocean water, fish, rock dust, etc. But when it comes to correcting specific soil deficiencies, it seems picking up an organic dry fertilizer such as calcium carbonate or rock phosphate is often the way to go. You can use a dry fertilizer applicator like a spreader, or just your shovel or even your hand (always a good idea to wear gloves). And I have no problem using a bit of fertilizer if it’s going to help me produce more food with more nutrition. But I still like to think locally as much as possible, so if you have any ideas for how we can get large amounts of calcium, phosphorus and potassium, let me know below. Certainly urine has some phosphorus and potassium, but much more nitrogen, so while we should definitely use it, we max out on N before we get to the P and K.
And compost/manure is a decent source of P and K, but if we apply enough to bring up our P, we’re going to have an excess of K.
Previous: Organic Fertilizer – 2 Fertilizers That Help You MostNext: Is 10-10-10 Fertilizer Really The Best Garden Choice? There apparently are two common forms of lime, and one of them (dolomite) is high in magnesium. What does excess magnesium amount to? Dolomite seems to be the cheaper of the two. Magnesium helps give the soil structure, but as with potassium, too much of it causes compaction and a deficiency in calcium. Calcitic lime generally has a much more appropriate ratio of calcium to magnesium for our soil. Calcium carbonate does not contain magnesium. I’m starting to think you are a fraud. Thanks Lars. Yes, there’s definitely a lot of materials that can be used for broad spectrum nutrition, whether composted or just buried in the soil. It’s the important main nutrients I’m also really interested in today. I wonder why at my agronomy college, they tell us that the average soil levels of K should be around 110’s, and P around the 15’s… are someone deliberately trying to make non-nutrient dense food? Well, that’s a good question. There are a lot of factors that determine why the suggestions are what they are. Certainly research is one of them, but so is corporate profit. I won’t get into detail here other than to say that in the organic/biological world, we want P and K to be about the same. So do you recommend 10lbs lime/1000sq ft every year, once a year? Because I would much prefer to do that and just skip soil tests. I do recommend that for people who are unwilling to soil test, but a soil test is still important to figure out how much calcium you actually need, and because of course there are many other nutrients that you may need. Hi Phil, I appreciate all the advice. Thanks. FYI, I do rinse and save all my egg shells. I also dry banana peels everyday. As well, I save coffee grounds. When I have a sufficient amount of dried banana peels I grind them to a powder with my food processor. I then add half an equal amount of pulverized egg shells and one days worth of coffee grounds to the mix. I don’t have enough of this home made fertilizer for my garden, but I have been using it on my house plants all winter (digging tablespoons into the top layer of the soil and then watering). Within a month of using this mix the plants have perked up produced flowers and new growth, of which I have not had in previous winters. Is there anything else I could add to my mix? Eggshells for Calcium, bananas for potassium and coffee grounds for nitrogen , am I missing something to balance this out better? Would dried kelp be a benefit? Thank you! That’s all good, and yes, kelp would be great, too, as would a bit of urine mixed in 20 parts water. Thanks for sharing Ed. Yes, I’m a fan of humates as well. Can sometimes be very helpful. Is calcitic lime a type of calcium carbonate? When I originally started my garden, my tomatoes had blossom end rot. I thought it was due to a deficiency in calcium so I started adding lime & Epsom salt (have no idea if this would be considered organic) to the holes that I planted them in. I just had a soil test done and the results stated it was high in calcium. I’m curious if my soil was initially deficient in calcium, how it got to be too high in calcium if this was all I was adding other than compost. Also, would calcitic lime be good for the lawn? Whew, my head is swimming with so much new info! Calcitic lime is mostly calcium carbonate. Blossom end rot is often associated with calcium deficiency, but in that case it’s often caused by irregular irrigation (too little/too much/etc). If you only added lime to the planting holes, it wouldn’t impact the whole soil all that much. And I’ve seen your soil test – it’s low in magnesium and sulfur, so obviously the epsom salts didn’t have much impact on the soil as a whole (although I’m not sure how much you added of each fertilizer). Less than 10% of soils are high in calcium. Yours is one of them and so is mine in 1 of my gardens. I consider us lucky. We’ve emailed about how you’re going to go about moving that in the right direction, which will be fun to see. Is it possible to add too much calcium? Absolutely. It’s possible to add too much of pretty much anything. That’s why I say use only 10lbs/1000 square feet unless you have a soil test telling you that you need more. It has much more potential to harm microorganisms and plants, so isn’t recommended much in the biological world. I know it’s best to apply it during dormancy in order to decrease these problems, but I’m not sure how much to use. I grow all my own produce eggs and fish. Im disabled so, I cant turn a compost pile, dig or weed garden.Once a year my son digs 2 foot deep trenches across my garden which I fill gradually with spoiled produce, yard trash, coffee grounds from church, any unwanted trash fish from local pier, crabs and shellfish plus other leftovers from my local chinese buffet restaurant and anything not made of metal plastuc or glass from my daily trash. I throw on homemade bokashi soaked newspaper…cover with 6 inch soil and layer cardboard in top. This results in few weeds…6 ft tall heirloom tomatoes, 2 foot long squash…and last year 8 center heads of broccoli from each plant plus many harvests of greens from the same plants. Below is this years broccoli which haven’t started to head up yet but have already produced several bushels of greens that are much sweeter than collards. I cant afford to purchase any fertilizers but did broadcast 10 pounds of azomite 2 years ago when i first had the grass tilled in to start this garden. Awesome photo! Nice story, too. Thanks for sharing. You can mix them all together. Just remember that potassium and phosphorus should only be applied when you have a soil testing showing you that you need them. It’s a good product, but it’s more of a short term helper than a long term plan. Soft rock builds soil phosphorus for the long term. I like the article but am concerned the ash recommendations are too high. Yes that’s an easy source of good calcium and potassium but the ash form applied at close to 10 lbs to 1000 sq feet would be murderous to the soil microbes. Ash is an extremely harsh material for soil biology – any life – think lye! You will get the mineral release but you will loose out on building your soil system. Perhaps 1/4 lb max per 1000 square feet? Maybe a few tablespoons. Ash is a hard material to use for significant amounts of nutrients. Another concept exploring is activating your calcium and perhaps greensand as a K alternative to ash by composting the rocks right through your composting cycle. This will greatly increase their availability, coat them with biology and allow the organic matter to chelate (neutralize the charge to become more plant available) some of the released nutrients. Often compost itself is high in potassium, especially made without animal products, mostly kitchen scraps.Any experience out there with high ash applications? I have never applied it that high due to heeded warnings.Most soils have loads of potassium in them but it won’t show on a standard weak acid soil test. A total test used by mining companies which uses incredibly strong acids to break everything down will give you a sense of your K potential. Whatever has caused your K to lock up and become un-soluble is probably going to lock up more K. So applying K works in the short term but the long term strategy is to work with the soil biology and build really healthy plants to feed that biology with enough energy to break those strong bonds of the K that’s ‘locked up’. Thanks for reminding me Harris, I forgot to say to use ash during the dormant season. It can be hard on biology if applied during the growing season. I’ve updated that. I’ve never had a problem applying up to 20 pounds of ash per 1000 square feet, but I do that on soils when I know they need Ca and K.And even better would be to add it (and lime and whatever else) to the compost pile, unless we’re trying to limit compost use due to already high P and K.Agreed that we need to focus on biology too, as I often discuss in other posts, but sometimes I feel the organic movement moves too far into the biology camp without recognizing that we need to work on soil chemistry as well. There’s a balance there. Thanks for sharing. Stan, After studying the benefits of comfrey for herbal medicine, I have found numerous references to the use of comfrey for fertilizing garden plants and vegetables. Comfrey contains more nitrogen, potassium and phosphorus than animal manure. Comfrey plants have very deep roots that bring soil nutrients to the surface foliage of the plant, and the leaves are loaded with essential nutrients, and can be used around fruit trees and vegetables, whole leaves or chopped. A very nutritious (for plants) tea can also be made. Best yet, comfrey seems to be easy to grow and very productive, and can be harvested 3 or 4 times per year. Jerry, that sounds like something I might like to try. It would be great to use something I harvest right out of my garden! Is there a website that you would recommend with instructions on how to make the comfrey tea. I’ve read a couple things on how to make compost tea but it seems like a lot of work. Thanks so much Jerry, looks like some great info! Yes, it’s wonderful stuff. Not necessarily great for correcting the specific nutrient imbalances that we’re talking about here, but an excellent all-around fertilizer. Once you have it planted, it’s difficult to get rid of, so just be mindful of that. Perhaps you were recalling the case of Roger Williams, regarding tree roots and skeletons. It’s no problem to have different opinions, but a horticulture degree from Iowa State is actually a detriment in my view Mike – in my opinion, you’re taught a very different paradigm than what this planet needs. But you are right that parts of Iowa, especially in the north, do tend to have plenty of calcium already. I worked for a year in an organic restaurant, and brought home a 5 liter bucket of egg shells nearly every day. I still (3 years later) have jars of the pulver i made from them. In the same way coffee shops are often more than happy to give away used grounds, maybe egg shells could be sourced from restaurants. I use a lot of newspaper and cardboard as my bottom layer of mulch which attracts a lot of pill (rolly-polly) bugs. i have never had a problem with them until this year when they are eating all my green beans sprouts. I don’t have beans making it past the first two leaves. Any help? You can control them with many of the same techniques that are used for controlling slugs: beer in a plastic container set down into the soil, 50:50 yucca extract and water sprayed onto the soil around plants, diatomaceous earth (DE), etc. The DE and beer will kill some beneficials, too, so it’s always about finding balance. If you can just control them until the green beans get bigger, that may be all you need.And then improving the health of the plants can really dissuade the pill bugs from eating. As for what the plants need, that’s not always so easy to tell. That’s when soil testing and fertilizing comes in, as well as spraying microbial inoculants and liquid organic fertilizers (whether homemade or purchased). My favorites are EM/SCD Probiotics, liquid seaweed, and liquid sea minerals. You erased my dissenting opinion. I have an ag degree from isu, noted soil science institution. I have horses and know that alfalfa is high in calcium. I’m wondering if mixing alfalfa into the planting soil would help. I’d love to have your thoughts on that ! Keep smiling ! Sure, alfalfa is a nice mulch/soil amendment (if organic/non-gmo), but I believe it’s less than 2% calcium – certainly not enough to make a big dent in a calcium deficit, but makes a nice mulch. Thanks for that feedback ! And, especially, thank you for the reminder to consider the alfalfa’s non-GMO/organic status ! Thinking about it, I doubt is either of those ! I thought nitrogen was one of the three basic fertilizers. You can use human urine diluted in water. True, nitrogen is one of the big 3 that are included in most fertilizers, and it certainly has a huge role to play in plant health and growth, but it’s often overapplied, and it’s pretty easy to get sufficient nitrogen in a home garden (and you’re right, urine can play a big part in that). I much prefer that people focus on calcium. Phil have you ever used Azomite?? Never heard you refer to it.Story has it that a Volcano 18000000 yrs ago emptied its contents into a seabed around the utah area. It is 100% natural no inert ingredients!! !The name supposedly derived from the fact that it has every mineral in it from A-Z. It remined me of the sea water you have refered to so often. Iam currently using it and it seems to be working very well. I am on land where the builders stripped all the top soil.